An IVC filter is an implantable medical device. 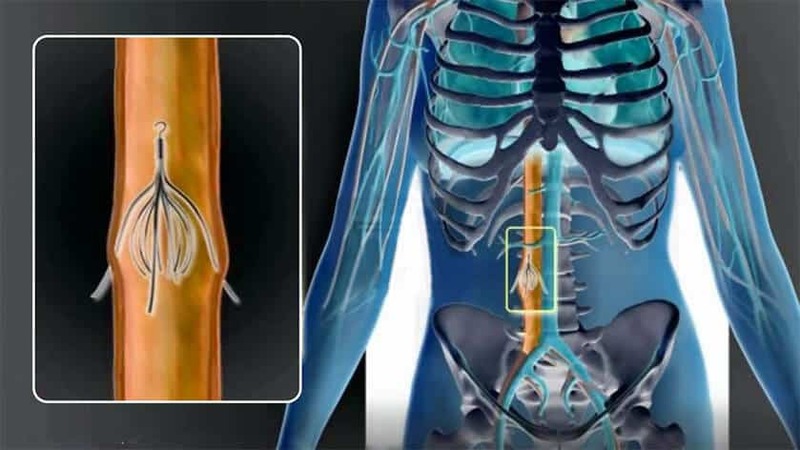 IVC stands for “Inferior vena cava.” The IVC is the largest vein in the body, responsible for collecting blood in the lower half of the body and circulating it to the upper half of the body. This blood then travels to the heart to be re-circulated throughout the body. The devices are small in size and implanted into the inferior vena cava. The device can be either permanent or retrievable. When it is permanent, device remains inside the body in order to catch and break down blood clots before they become harmful to the body. The retrievable devices are placed temporarily to catch blood clots and removed once the risk of blood clots traveling to the heart has passed. These blood clots, if untreated, can find their way into the heart and/or lungs. The blood clots are then referred to as “pulmonary emboli” and can be fatal to the affected person. How Much Could I Receive If I Settle My IVC Filter Injury Case? Initial Cook IVC filter trial begins. Cook Medical wins the first significant IVC filter trial. Judge Young dismisses second scheduled Cook MDL bellwether trial, stating that Plaintiff’s suit was not filed within time period allotted by statute. The IVC filter trial was set for April 30, 2018. Initial Bard IVC filter trial begins. Jury awards $3.6M verdict to Sherr-Una Booker in initial Bard trial. Booker claimed the Bard IVC filter broke apart and subsequently injured her. Jury returns a verdict in favor of Bard at the close of second bellwether trial. Third Cook IVC filter bellwether is scheduled to begin. Third Bard IVC filter bellwether is scheduled to begin. Plaintiff Lisa Davis sues Bard in Michigan federal court regarding the G2 IVC filter. Davis claimed it broke and then eventually migrated to her heart causing damage. Her lawsuit documents stated she had suffered ongoing heart problems due to the G2 IVC filter device. She filed her suit in 2011. Attorneys for both parties informed the judge that a settlement was reached in March 2013. Kelly and Chris Vlasvich filed a lawsuit in Illinois federal court regarding the Bard G2. The Vlasvich suit claimed Kelly’s IVC filter broke apart and damaged her heart and lungs. The supporting court records showed the parties were close to a settlement in December 2014; however, Kelly and Chris Vlasvich dismissed their suit the following month. Kevin Phillips’ lawsuit regarding the Bard Recovery goes to trial in Nevada federal court. Phillips stated his IVC filter broke apart and then perforated his heart. Ten days into Phillips’ trial, Bard settled for an undisclosed amount. The FDA received reports of adverse events associated with the use of retrievable IVC filters. Some serious problems associated with the device include: device migration (this can cause blood-flow to wrongly pass into the heart or cause device failure, meaning blood clots continue developing in the body), filter fracture, embolization (movement of the filter or fracture fragments to the heart or lungs), perforation of the device (which puts the user at high risk for internal bleeding), and embedment of the device (which makes the device difficult or impossible to remove, causing a once removable device to remain permanently). What Devices Are Being Named in These Suits? Some of the devices named in various IVC filter lawsuits include the Cook Celect filter, the Cook Günther Tulip filter, the Bard Recovery filter, the Bard G2 filter, the Bard G2 Express filter, the Cordis Trapease filter, the Cordis Optease filter, the Argon Option filter, and the Argon Option Elite filter. According to Current Lawsuits, What Are The Alleged Reasons For The Adverse Events That Have Occurred as a Result of Using The IVC Filter Devices? Current lawsuits against IVC filter companies are claiming that these adverse events are the result of manufacturers’ negligence, failure to warn consumers about potential dangers of their products, manufacturing and design defects, breach of implied warranty, and misrepresentation of the efficacy of their devices. Specifically, in the claims against C.R. Bard and Cook Medical, plaintiffs claim that the companies manufactured a defective device that they knew or had reason to know was defective. Additionally, they continued to sell the defective devices for profit without issuing any warnings of the risks of filter failure to the public. The types and amounts of damages that an individual can expect to receive from a lawsuit against these companies depend entirely on the specific facts of the individual’s case. Typically, when an individual sues a manufacturer, the individual is asking the manufacturer to be held accountable for his/her pain and suffering, medical expenses, lost wages, and other damages. Examples of questions that a jury might consider include: what type of injuries were sustained as a result of implantation of the defective IVC filter? ; how long was the patient out of work due to injuries sustained, and what was their earning potential? ; did the injury require hospitalization? ; how many people are financially or otherwise dependent on the affected patient? ; etc. This time period depends on what state you call home and what state you were injured in. It ranges from state to state. Regardless of where you are located in the United States, we can help. For example, in Florida, an individual has four years from the date of the cause of action to file a lawsuit. This means that he/she can file an IVC filter lawsuit within four years of the date that their injuries first occurred – not the date that the individual received the implantation. What Evidence is Important in These Cases? In any type of personal injury case, including products liability claims, the medical records are the most important pieces of evidence. It is important to keep up to date medical records and make sure all doctor visits, symptoms, and injuries are well documented. NBC News investigates the safety of a medical device that was designed to help save Dodi Froehlich’s life, but instead almost killed her – a device implanted in thousands of people. What is The status of The IVC Filter lawsuits? Are The IVC Filter Lawsuits Currently Taking Place in an MDL or Class Action Suit? Currently, there are several thousand individual claims against the IVC Filter manufacturers Bard and Cook. In fact, over 25 deaths have been connected to these defective IVC filters. In February 2015, in Nevada, the first claim was settled to plaintiff Kevin Phillips, who required open heart surgery to repair the injuries sustained from the dangerous implanted IVC device. The settlement amount was not released. Because so many actions were pending against these companies, the U.S. Judicial Panel on Multidistrict Litigation (JPML) decided in 2015 to combine the majority of these cases into a Multidistrict Litigation (MDL). Currently, individual IVC filter suits are overseen by two judges – one for Cook IVC filters, and another for Bard IVC filters. The purpose of a MDL is to streamline the discovery and ruling process, avoiding different rulings and procedures applied by different courts. A MDL is typically preferable to class action lawsuits with product liability claims, since MDL claims can remain independent – unlike class action suits where all plaintiffs are forced to accept the general settlement and verdict given to the entire class of claimants.